The team was called out at about 2.25pm on Tuesday after Claire Charlton went into labour at Bellingham, Northumberland. 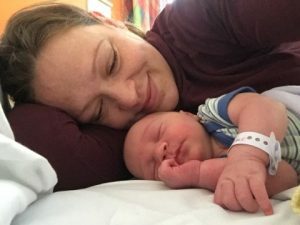 The baby boy was described as being in a breech position, which means it has its feet facing downwards. This is a relatively rare occurrence and places both baby and mum at a slightly higher risk. Facing an hour transfer by road, GNAAS activated from its base at Durham Tees Valley Airport. 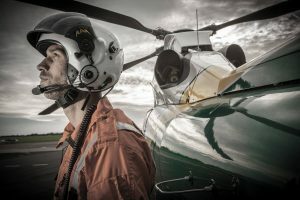 GNAAS paramedic Tim West (pictured below) said: “The call came in to the ambulance service saying the patient’s waters had broken and that the baby was presenting in an unusual way. 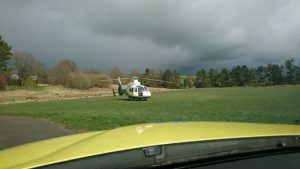 In light of this, and the distance and time it would take her to get to hospital, given her rural location, we decided to activate. The speed and versatility of the aircraft was important in this incident. It allowed us to get to the patient quickly. Our critical care team also played a vital role – accompanying Claire all the way to hospital and ready to administer a wider range of care options if needed. Thankfully all ended well, with beautiful little Reuben arriving shortly after the pair landed at Northumberland Specialist Emergency Care Hospital at Cramlington.